Product prices and availability are accurate as of 2019-04-18 14:31:41 EDT and are subject to change. Any price and availability information displayed on http://www.amazon.com/ at the time of purchase will apply to the purchase of this product. Brighten weddings, holidays, parties, and all your special events with eye-catching globe string lights! 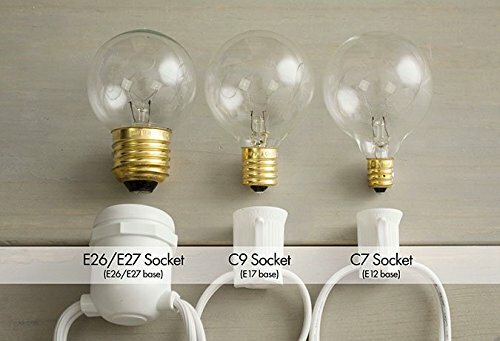 This 50 foot long C7 brown wire strand features 50 incandescent bulbs with E-12 sockets spaced at 12 inch intervals, and is fantastic for dressing bistros umbrellas, restaurant patios, and outdoor home entertainment spaces. It's made with 18-gauge, SPT-1 wire and is safe for outdoor use. VERSATILE DESIGN - This brown wire globe string light captures wedding sophistication and holiday fun with its timeless design. 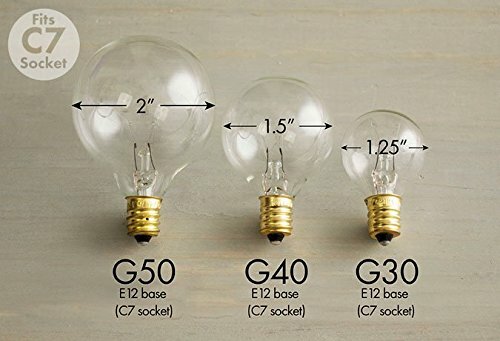 CLASSIC STYLED STRING LIGHTS - This 50 foot wire globe string light set illuminates 50 clear G50 incandescent bulbs, a classic choice inspired by vintage lighting. Each Light is spaced 12 inches apart. This set comes included with 50 bulbs, plus 2 spares. END-TO-END - This strand can be connected end to end up to 2 stands (100 feet total). It has a 6 Inch lead length from the plug to the first bulb, and 6 inch tail length from the last bulb to the end of the cord. When you connect the strands the spacing stays consistent with the rest of the strand. 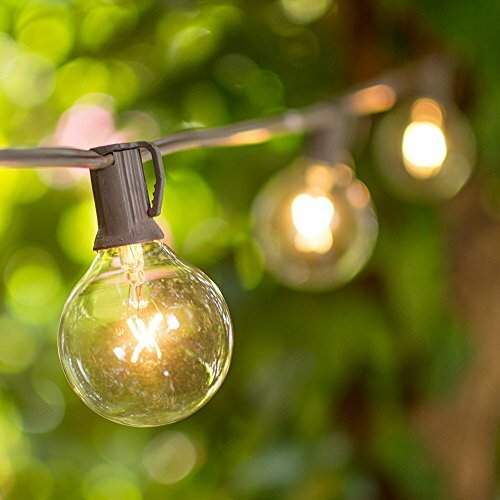 INDOOR AND OUTDOOR - Take this string light set indoors or outdoors as it completes patio decor, weddings, birthday party settings, and bridal/baby showers and more. Add this strand to your barn wedding or fill your garden party with its elegant illumination. HIGH QUALITY DESIGN - This strand is made with 8-gauge, brown SPT-1 wire. The strand uses a standard fused plug; 130 Volts, 350 watts, 2.7 Amps.